Thirty energetic , farsighted people met with a common goal in mind- to ensure that your children and their children and generations to come will always benefit from the vital health care available through St. Michael Hospital, now CHRISTUS St. Michael Health System. 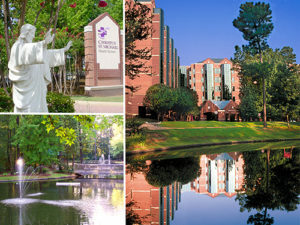 Born out of a need and desire of the Sisters of Charity of the Incarnate Word – Houston and others looking to the future, St. Michael Hospital Foundation was formed with the ultimate purpose of meeting the health care need of the Texarkana area then, today, and tomorrow. Approached with the idea of working together for the sake of long-term quality medical care, each member of the new foundation gladly accepted the challenges of guaranteeing the financial health of St. Michael Hospital as it continued to serve our region. The founding members sought to make certain St. Michael would be able to continue to expand services and offer cutting-edge technology, advanced equipment and methods while never ceasing to focus on our philosophy of compassionate, faith-based care. Thirty-four years later, CHRISTUS St. Michael Foundation remains an instrumental force in ensuring CHRISTUS St. Michael Health System continues to extend the healing ministry of Jesus Christ. In the midst of a rapidly changing health care environment, we are challenged to deliver advanced health coupled with cutting-edge technology and services while ensuring those most vulnerable in our society have access to health care. Inspired by the CHRISTUS St. Michael Foundation, community support has resulted in CHRISTUS St. Michael being home to the region’s only: Electrophysiology Lab, Hybrid Operating Suite, Level III NICU, Breast Imaging Center of Excellence, and accredited Comprehensive Cancer Program with Genetic Testing available.